Dark Circles Under Your Eyes Got You Down? You're not alone. Welcome to DarkCircles.net! If you're surprised by the blue when you look in the mirror in the morning, or if you are a fellow raccoon-person, you're in the right place. When you have those big dark half-moons under your eyes, an objective observer is likely to guess your age as 8-12 years older than without those under-eye blemishes. Dark circles make you look older, tired, stressed, sick, depressed and just plain bad. Dark circles under the eyes are caused by a very specific physiological mechanism. If you're interested in biology and/or science, you may be interested in learning more about this process behind dark under-eye circles. Most people are more interested in why they have dark circles. They don't care so much about oxidizing hemoglobin - they're more interested in learning more about hormonal causes or the link between allergies and dark circles. If that describes you, learn more about the causes of dark circles under the eyes. Lucky for us, the latest generation of cosmeceuticals and skin care products can get rid of dark circles under your eyes. They work fast and they work well. 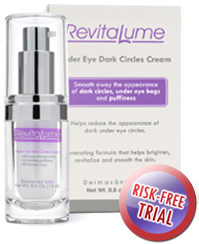 We offer RevitaLume, currently the most effective dark circle removal system available. That's right -- you can face the world without embarrassment or shame. We're pretty excited about the new lines of products available that can produce the kind of results that, only a few years ago, would've required surgery. You wake up one morning and they're there - the midnight-dark circles - and you look like you've gone nine rounds with an expert boxer. What can you do right now? Home remedies for dark circles under the eyes aren't as fast and effective as dark circle eye creams. But they do have the virtue of being inexpensive and readily available. (Some of them make good snacks, too.) Don't expect miracles from home remedies, but they can help you get through until UPS brings your RevitaLume order. Are your dark under-eye circles a symptom? Any doctor worth their salt will tell you, dark circles under the eyes can be a symptom of a larger problem. We discuss the health issues commonly associated with dark under-eye circles. Remember, if you think you're sick, talk to your doctor! Did you know some people resort to laser surgery, dermabrasion, face lifts and dermal fillers to get rid of their dark circles? It's true. We discuss your more drastic options, including going under the knife (or the laser beam) to finally rid yourself of dark circles. Hint: try RevitaLume first! You've got nothing to lose and a whole lot to gain. Were you looking for Dark Circles Radio Show, a weekly gothic and industrial radio show hosted by DJ Victoria on KZSC, Santa Cruz 88.1 FM.